"The Grape Apple Delight is a delightful and guilt-free fruit dessert." Sprinkle gelatin over the water in a small saucepan; allow to soften for 5 minutes. Cook and stir over low heat until gelatin fully dissolves, about 2 minutes. 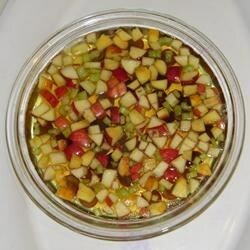 Remove from heat and stir in the apple juice; Transfer to a bowl and chill until the mixture begins to thicken, about 20 minutes. Mix the grapes, apple, and celery into the gelatin mixture and pour into a 4-cup mold; chill until set, about 2 hours. An easy apple crisp made with white cake mix, cinnamon, and butter.